This Valencia Orange Marmalade will be adored by marmalade haters. The orange zest is fine, leaving the pith out, making it sweet and orangey. My husband’s side of the family loves sour foods. They adore lemons and add it to everything. I had a hard time adjusting to my in-laws cooking when we first married because I come from a family that loves jams. The first time my husband cooked for me he made his mother’s sour chicken. After the meal, the intensity of the sourness led me to a mad dash to the bathroom with stomach spasms. Now I’ve learned to eat the sour stuff moderately. The first time my husband saw this he was floored. Jam is for breakfast, and definitely not HIS breakfast. It’s that ying-yang thing, I suppose. 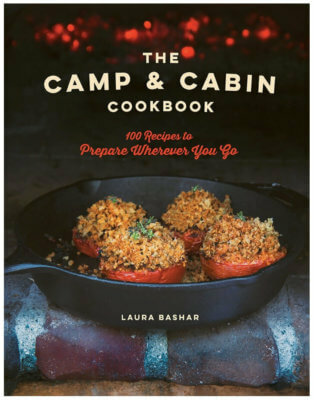 With a Persian twist, of course. I have a garage full of wonderful Valencia oranges from our trip to the orange orchards a couple weeks ago. Our refrigerator has been full of fresh orange juice and the house has been smelling sweetly orangey. My mother loves orange marmalade and since she was still visiting us, and I made some Valencia Orange Marmalade for her to take back to Texas. I am not a marmalade fan, especially of store-bought marmalade. It tends to be overly sweet, bitter from giant chunks orange rind and more sugary than orange in flavor. I made my zest fine, using a zester (not a grater, mind you) for my zest. And I used juiced my glorious Valencia oranges and kept the pulp, too, for added texture and flavor. The seeds were tucked away in a cheese cloth packet because they release natural pectin for the marmalade. I may not share this marmalade after all. You can even kick in out of the stratosphere with a dash of orange blossom water or Grand Marnier. I am in orange heaven right now. Cut the oranges in half and extract the juice from these oranges. 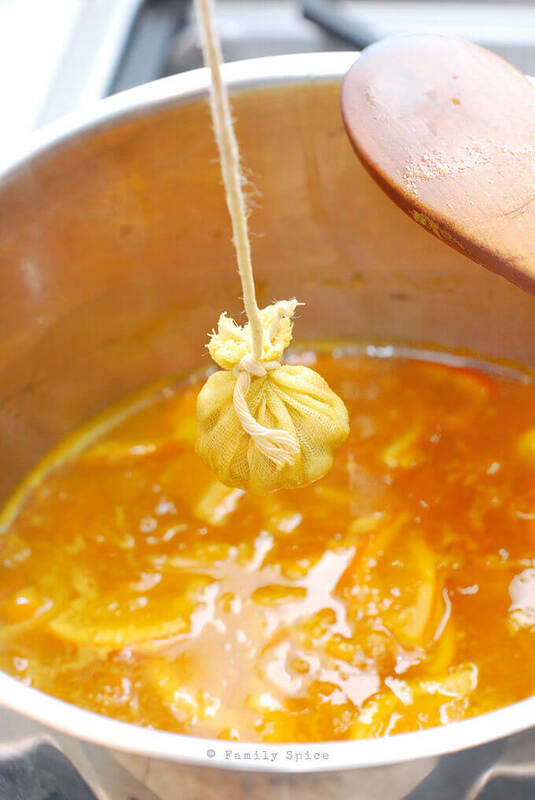 Reserve the seeds collected from juicing and place in a small cheese cloth, tied with kitchen twine. 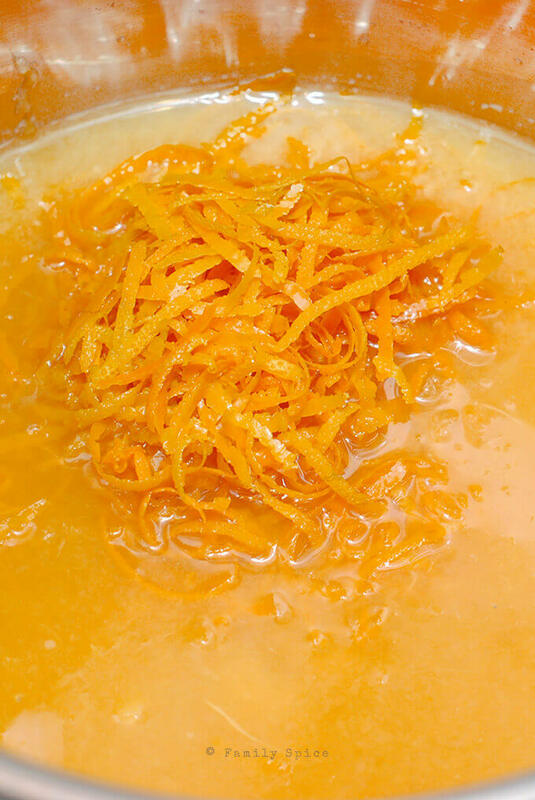 The seeds will release natural pectin needed for the marmalade. Stir until sugar has dissolved, then stir in the zest and packet of seeds. 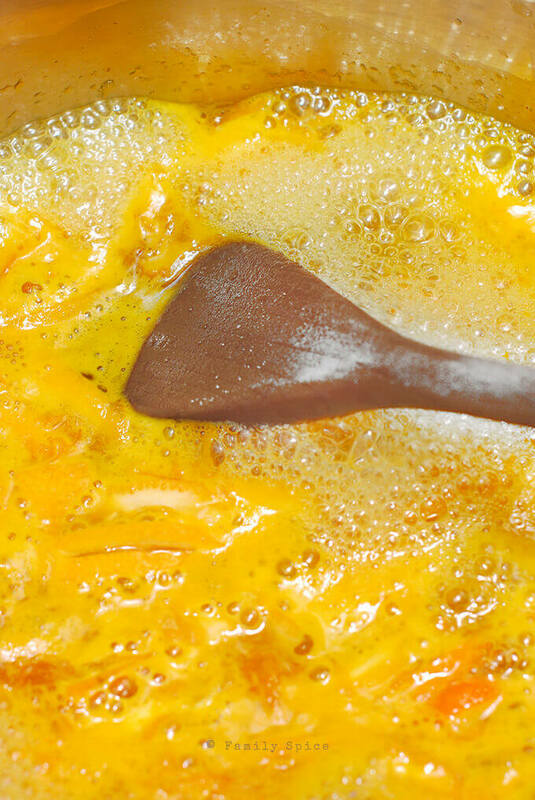 Bring mixture to boil, then reduce to medium heat and continue cooking until jam thickens, about 30-35 minutes. Remove from heat and let seeds sit in the marmalade for 20 more minutes before removing. Serving Suggestions: For extra flavor add 1 tsp of orange blossom water or 1 TBS Grand Marnier during the last 5 minutes of cooking time. 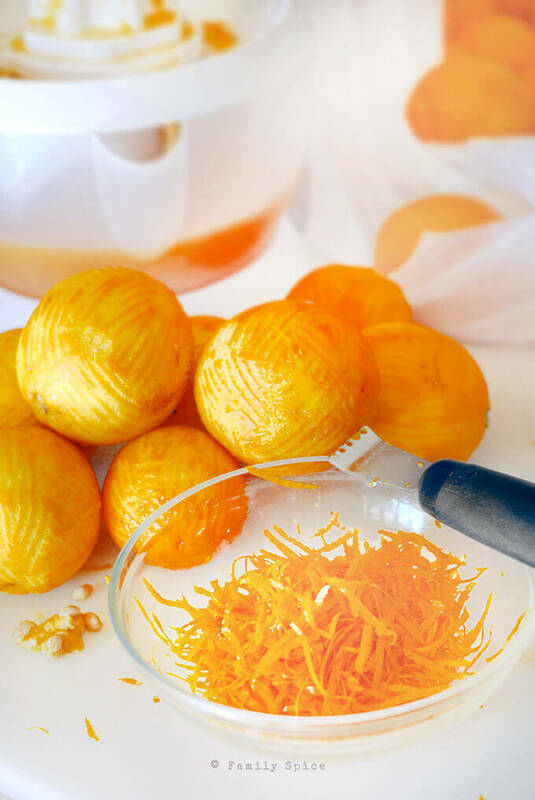 Cooking Tips: If you like larger bites or orange zest, you can scrape out the pith (white part) of the orange shells after juicing, and coarsely chop the remaining skin to desired size. Previous Post: « Yes, I’m Still Here. This marmalade is gorgeous and it looks so delicious! Perfect for toasts or muffins! Stunning! I'm hoping to make jams this year – my first time canning! I can't wait to try! Orange heaven – no kidding! Those pictures are gorgeous. 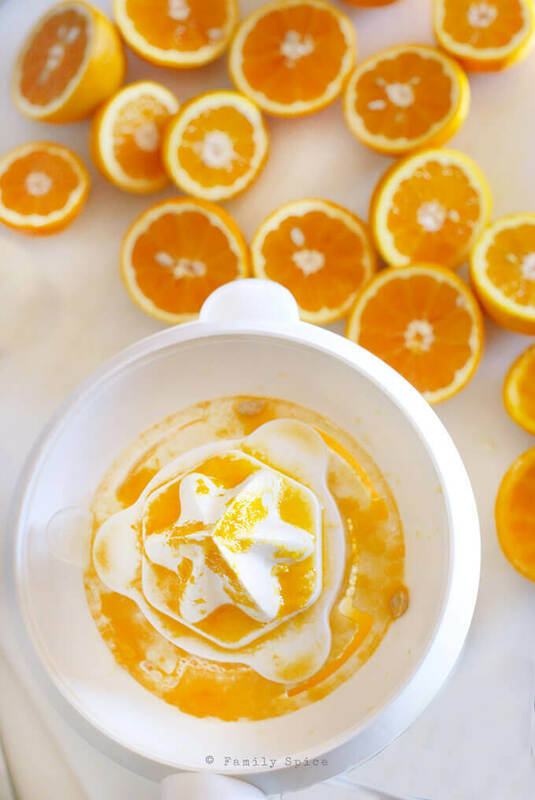 I love orange marmalade when it's homemade…and your suggestion of a little Grand Marnier sounds decadent. Yum! 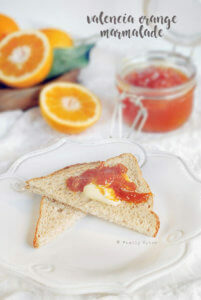 We love orange marmalade and your recipe sounds so good! I love the last photo – so cute!